When the offer to move to Korea was made in February 2014, 18 months seemed like an eternity. How would I fill my days? Who would be on the island to socialise with, and would they be like-minded? How would I cope driving on the ‘wrong’ side of the road and completing basic everyday tasks in a non-English speaking country? Who the hell actually willingly moves to Korea?! All valid questions. And fears. Fear of the unknown can either propel or paralyse you. It’s now nearly two and a half years since we arrived and it feels like yesterday. I absolutely elected the propel option. We’ve been fortunate enough to travel some ten international trips each year, experience a completely different culture, live on a beautiful island, enjoy four distinct and very beautiful seasons, have seven lots of visitors (and hopefully still counting), and most importantly, connect with this phenomenal expat community. By year end, all Inpex (Rob’s employer) families will be gone, leaving me the only wife still here for an exact-unknown period. For me, this means making the absolute most of the time I still have my women friends here, and leaving no ‘social stone’ un-turned. For all those departing, they’re now very much thinking ahead to returning ‘home’, together with what this experience has meant for – and to – them. In part one of this blog, four of ‘the girls’ share their thoughts here. I have been an expat for five and a half years, and it will be close to six years living out of Australia by the time we move home to South Australia. I was in Singapore for ten months and then Kuala Lumpur for fifteen months. I thoroughly enjoyed my experiences there and did not want to leave either place, and the lovely friends we made. What are the three things you’ve enjoyed most about living here? I have enjoyed being closer to nature living in Geoje, after living in Singapore and Kuala Lumpur. Although South Korea is quite challenging at times, I have felt part of a close knit expat community and also a recognised face in our village in Janseungpo. Walking around our scenic coastal road and in the town, I get lots of waves and greetings after being here for three and a half years. The post man knows my name; I say “it is nice to see you” to the check-out chick in our local Top Mart in Janseungpo. We have a favourite Korean BBQ in our village and know the family. The daughter has just returned after eight years in the USA, and I think is finding it really hard to readjust. She finished high school in America and completed a degree in Minnesota and Boston, and I think may be back because finances are tighter for her Mum and Dad. We are now seeing the impact of the low oil price and the diminishing work force in the ship yards. I have hiked with women from all over the world the best way to really experience Geoje, with the beauty of the mountains and the sea is from the top of a mountain! From the top, you can see that the island is surrounded by hundreds of islands, and just how mountainous the countryside is. We have had a twelve peak challenge the last three years, (12 peaks in 12 days), climbing the peaks on the island with women from a variety of nationalities and some of their dogs. It was a wonderful way to get to know one another, while exploring the island and keeping fit. What are the things you’ve least liked about living here? Or found most frustrating/challenging? Driving on the roads is horrendous. There is not much courtesy shown, and it is all about being first and pushing in and there is no safety awareness whatsoever. We also laugh about the lack of courtesy shown when getting off a bus, or more generally, but it is really frustrating! Almost everybody is constantly on a mobile device and not looking where they are going! Richard used to laugh and say that they would come off second best if they walked into him, as he is larger!! There doesn’t seem to be as much awareness about personal space. You know you are back in Korea, when you are in the front of the line in the baggage collection carousel, and someone stands right in front of you…..I mean right in front of you, that they are literally touching you! Sourcing the foods was interesting when we first arrived, but there is a lot more Western selection, including fruit and vegetables than there was three and a half years ago. There are now limes and mangos in our local supermarket! We have not been interested in eating the seafood. Much of it we cannot bring ourselves to eat, and the way it is displayed is not particularly appetising. The oysters are not in shells, but in plastic bags, and the seafood in the wet markets it is not refrigerated, as we are used to. Much of the fishing is also very close to industry. Dried fish is a Korean favourite, that I have not been interested in trying! We do enjoy the spicy Korean ribs and Korean BBQ and will be trying to replicate the experience for our friends back home. When we go to Busan, the speciality is Hotteok, which is a delicious pancake with nuts and seeds in the middle. The first time I tried it, it was in freezing February in the Gukje Market. It was so good. The Koreans line up and take selfies in the queue, as it is famous in Busan. The friendships that I forged with people from all over the globe. 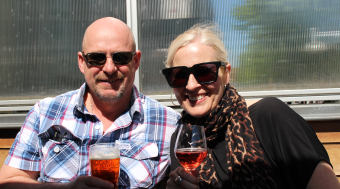 The fun of being an expat, and having the free time, which is the life of an expat wife! All of your fellow expats have free time, so it is like constantly being on an adult excursion. The quirkiness – Koreans like the silliest things!! What scares or worries you most about returning home? The uncertainty of knowing exactly what we will doing as far as work goes, and also setting in to a new community. I know I will be much better at it after sourcing friends in three countries, but everybody will have a routine and will not be needing friends, as my expat buddies were! Having to wait for an appointment, as it is easy to get into the dentist or doctor in Korea. What are you most looking forward to when thinking about home? Being closer to family and reconnecting with friends. Fresh air! Rubbish bins!!!! (you can’t find any here, and rubbish is left on the roadside). The food options – grocery shopping will be simple! I will be able to look at shoes and clothes and they will be my size and possibly take my fancy. I would walk past a store in Korea and see check fabric with lace, or tee shirts with English writing which didn’t make any sense…..like the day we saw a lady wearing a wind cheater which said “Fat Dog”!? Having said that, some of the fashion is really great. I do like the way the Korean ladies wear layers, and look very stylish. Occasionally you will see a woman in the more traditional clothing, and they look absolutely amazing. Michele and Mat Perry, both 45 with three kids, Hunter 17, Jackson 14, Indiana 10. We left on our expat journey from Perth Western Australia, in January 2013 when we went to Kuala Lumpur for eight months. After a short stay back in Perth we were then based in Singapore for 14 months then on to South Korea for almost 18 months. We will be returning to our family home in Mandurah Western Australia which has been lovingly looked after in our absence by Mat’s parents. The seasons. I have never lived anywhere where the seasons change so dramatically and instantly. It’s so beautiful. The autumn and spring time blew me away….and I liked winter far more than I thought I would! The food! I have taken a real shine to just about everything Korean food-wise. Even Kimchi….. The landscape….the mountains and the coastline on our beautiful island home…it still takes my breath away…and I love a hike up a mountain! Sorry I know I’m only meant to have 3 but I can’t pick just 3…. The convenience…I’m going to miss being able to walk outside my door and get anything almost 24 hours a day. The people! Korean and our expat family…..I’m really going to miss my expat peeps! And Seoul….. I love Seoul! What are the three things you’ve least liked about living here? Or found most frustrating/challenging? I find it hard to be too negative as it’s been such an amazing experience. Even if I say “the driving”, I haven’t really found it challenging nor really frustrating. It just amuses the crap out of me! I have found the language hard to pick up…but I can’t blame the Korean language…it could be me. I just find it’s hard to retain…very wordy…and long words sometimes! Ooooh I know….. I won’t miss the Guard blowing his whistle!!!!!! (I must tell you that as I typed that, my auto correct changed it to “the guard blowing his sister”! Lol). Oh and scooters driving on the footpath…freaks me out every time. They probably know exactly what they’re doing but they seem to come out of the blue! All of the things that I wrote that I enjoy the most about being here. I will simply miss the experience…every day. The landscape, the people, the food, the driving and the convenience. All of it!!! I’ll just miss being here I think. Oh and underfloor heating. I just KNOW I’m gonna miss that! Change. There are a lot of things that have changed at home since I left four years ago, and I/we have changed also. I’m not too sure how that is all going to gel for us all. I hope the kids find their place again among their friends and peers. My friends and my home and a clear blue sky. We have had a lot of haze and cloud in the three countries we’ve lived in. Although when the sky IS clear in Korea, it’s magnificent! …..And I’m sorry I’m going to have to say it. LIVE MUSIC!!!!!! Aaaaaaaaagggghhhhh…CAN’T WAIT!! And finally, the thing I am most grateful for in my expat experience is what it has taught my children. It is very difficult to teach adaptability. It’s only something that comes from being put in many different situations, so I am very grateful for that. Most importantly, they have all developed a natural acceptance of people and situations that I could never have instilled in them. They don’t fear change, are confident and are happy to step outside their comfort zone. I believe that this could be some of the most important attributes they will take with them on their life’s journey. How fortunate we all are to have had this experience. Married to Matt, with two girls aged 12 and nine. We came to Korea from Geelong, Victoria (lived there the last 13 years). We are moving back to Australia at the end of October to the Gold Coast, opting for a warmer climate, as Matt will be FIFO. We have lived in Korea for just over two years. Friends that have become our family over here. You know you are never alone or someone is always there if you need them. Friends on tap to meet at our favourite coffee shop Drop Top. Travel, travel and more travel. I have a theory……try not to be here for longer than 10 weeks straight. What are the three things you’ve least liked about living here? Or most frustrating/challenging. At times you are just told “No” (seemingly for no logical reason) for example when asking if they have a shoe in your size or trying on clothes and you are told you can’t r (no deal sign) when there is a clear sign above their head saying “fitting room”. I’d at least like them to pretend they looked for a size before telling me “Anio” anyway. Spitting, coughing and sneezing without covering the mouth. Friends, for sure. Being with like-minded people who are experiencing and doing the same things as we are. Not having to pay bills and the lifestyle of being able to travel frequently. After speaking to a girlfriend the other night who has already repatriated back home, she speaks of being lonely. I have thought about this a lot. Bills, bills and more bills. Going back to “normal life”. What are you looking forward to when thinking about home? Fresh air, clean beaches, BBQ’s in the backyard. Coles and Woolies and wandering those isles looking at all the wonderful food options. Our girls being settled into school and finding some good friends. I moved to Geoje Island on the 4th of August 2015 from Singapore, where I loved living and was not ready to leave. I soon embraced island life though as what’s not to love about living in an apartment complex with all your friends. The lifestyle here with four seasons is such a healthy change from that of Singapore’s stifling heat. My hubby rides to work each day and the kids have so many friends here that there are days when I either see no-one at all or I’m making what seems like a 100 toasted sandwiches. I have been living away from our home country of Australia for nearly four years, starting off our journey in Houston, Texas. As a family we have embraced the expat life style with all its ups and downs and some days, I can’t believe how lucky I am to have been on such an amazing journey. Creating a wonderful network of friends who have become my expat family. Getting the chance to learn and experience the Korean way of living. Climbing the stunning mountains that surround our island home, watching the changing of the seasons from on top of the world is breathtaking at times. Definitely the language barrier – it has been a challenge, especially when needing medical care (and yes we have google translate but you have got more hope of getting it right by playing Pictionary with the doctor, then by what google comes up with!!). The driving is another thing I won’t miss, having to be on high alert constantly because Koreans simply think a red light means drive through with caution, but overall Korea has surprisingly grown to be one of those places that I have learned to love and all the challenges that come with it. The bubble popping!!! We live a life where I often forget there is an outside world, our children are free to play and travel without the fears that follow kids in most western countries. Family and reconnecting with our old life, supermarkets where everything is in English, and driving on the right side of the road.